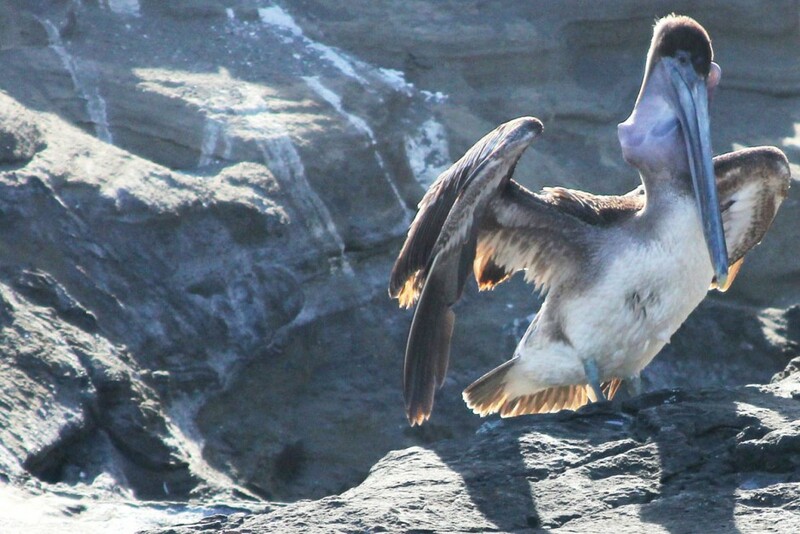 It’s easy to take good photos in the Galápagos. Many species of birds sit passively and stare as you approach them. On several occasions, the silent commands in my head (Move your beak, turn your head, a little to the left, a little more, there, that’s it) seemed to be answered psychically by the birds in my viewfinder. My trip to the Galápagos was an education. I learned more about wildlife in a week there than I had in a year of high school biology. While the apparent differences between the marine iguanas on several of the islands brought the theory of evolution home to my thick skull in a more concrete way than any of the birds did, it was the finches of the Galápagos that Darwin used to illustrate his ideas. The differences in the finches’ beak shapes were too subtle for me to see, even more than 100 years later with the advantage of modern digital photography’s instant playback. But the incredible diversity of the avian life on the islands is something even a biological bird-brain like myself can appreciate. My trip was courtesy of Ecoventura, who footed the bill for a week-long cruise for myself, along with other curious journalists and our guests aboard the Eric — 20 of us in all. Our educators for the trip were Ceci Guerrero and Yvonne Mortola, talented naturalists and communicators, who were with us every step of the way. We were divided into two groups of ten for all excursions onto the islands and directed not to get any closer than six feet from the animals there. The photos below are presented chronologically, following our progress as we made our way through seven islands of the Galápagos over the course of a week. 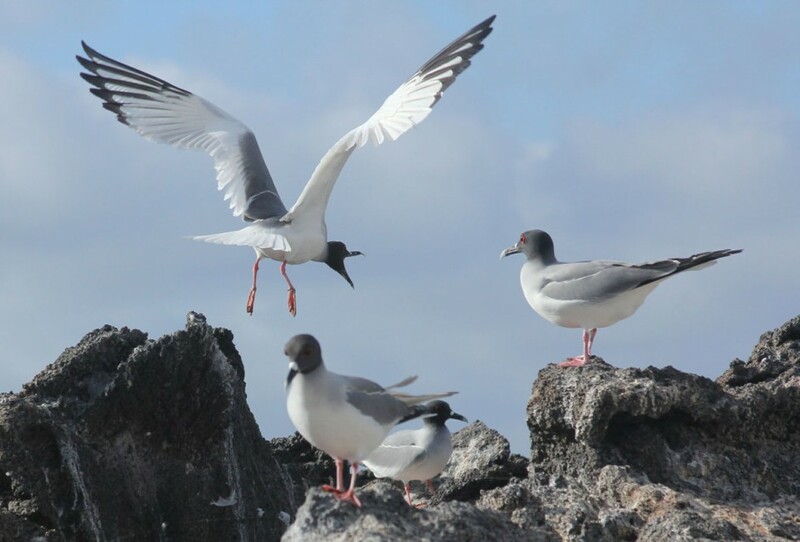 Swallow-tailed Gulls are a near endemic species to the Galápagos. 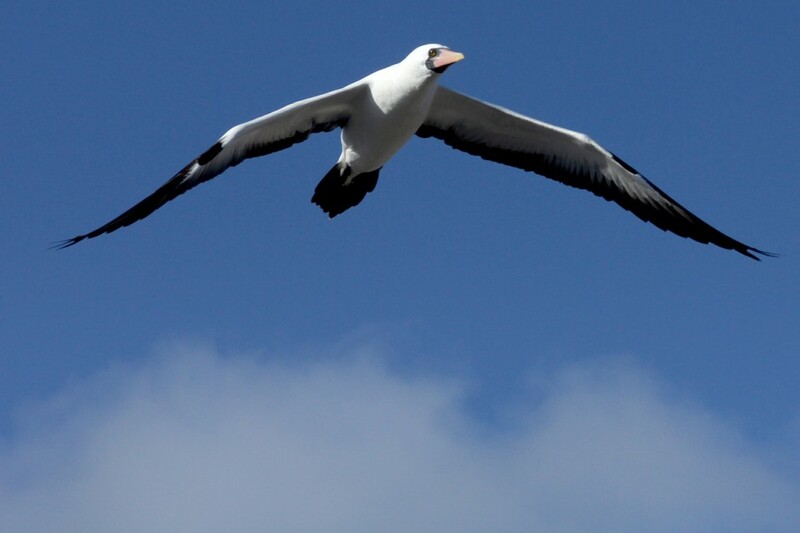 The only other habitat for these birds is Mapelo Island off the coast of Colombia. Here, two Swallow-tailed Gulls fight. This tussle went on for quite a long time, and our guide, Yvonne Mortola, said she'd never seen this behavior before. These are two young males who eventually settled their differences and separated. These gulls feed nocturnally -- they are the only species of gull in the world that do. Their cry is a weird one. They sound like lambs, almost, their staggered bleats contagious and noisy. Here, a Nazca Boobie quacks. Nazca Boobies were formerly thought to be Masked Boobies -- a bird that can be seen in the Caribbean, and in areas around New Zealand and Australia. The theory was put forth in 1998 and proven in 2002 through mitochondrial DNA that the Nazca Boobie (named for the tectonic plate on which it resides) differs from the Masked Boobie. 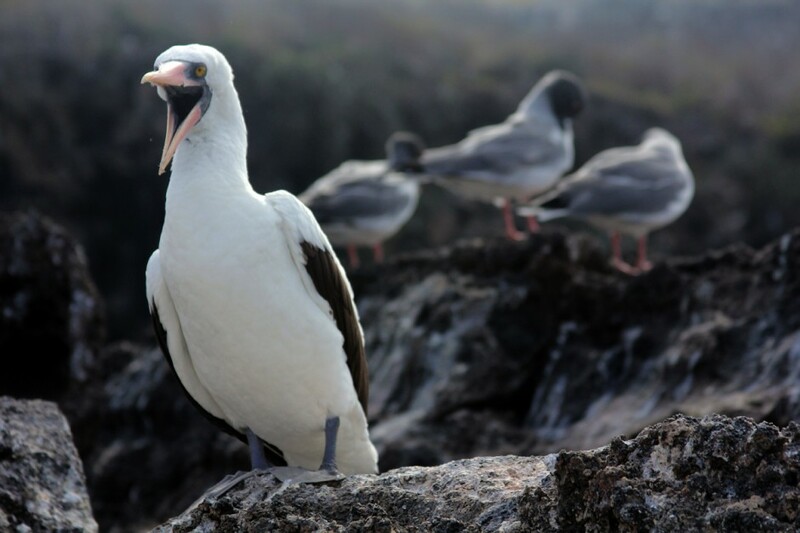 This bird can be found in the Galápagos as well as Clipperton Island and the Revillagigedo Islands off Baja. The Mangrove Warbler is a subspecies of the Yellow Warbler. 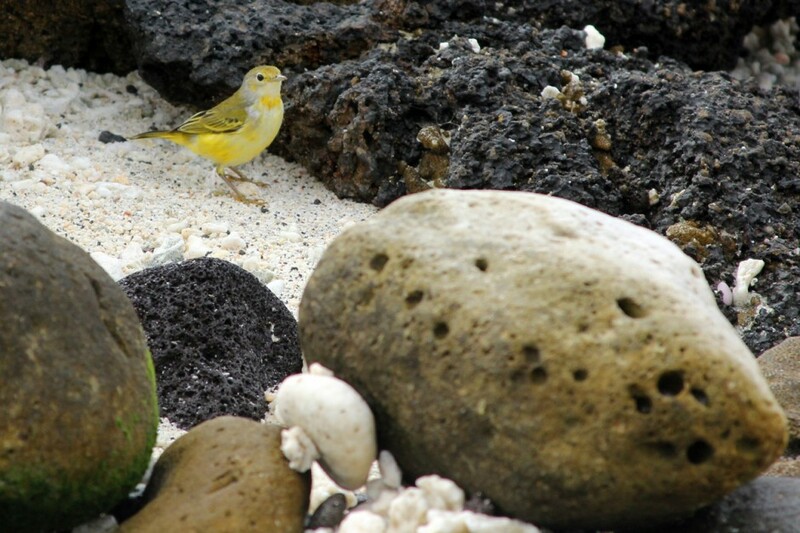 We saw this bird quite a bit throughout the islands. Our guide, Yvonne Mortola, said this was the first all white gull she'd seen. She's been a naturalist for more than 20 years, so he must be a rare bird, indeed. 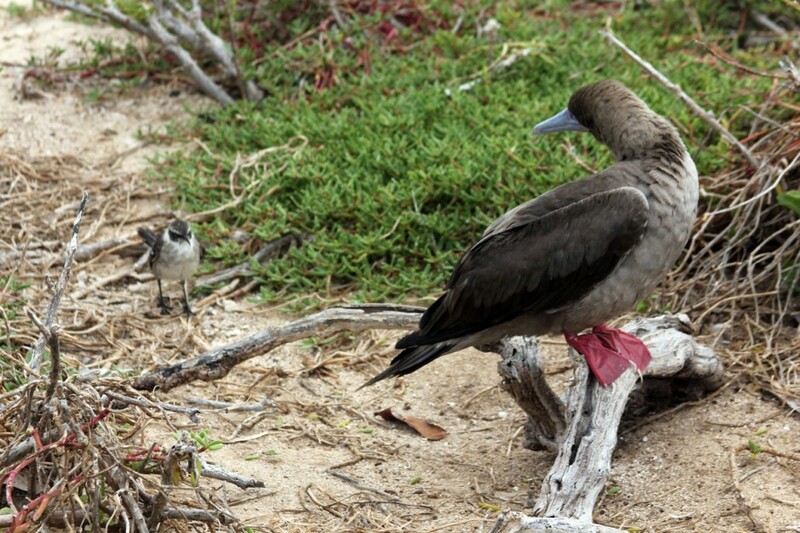 Here, a Red-footed Boobie spares a glance for a Galápagos Mockingbird. You might be surprised to know that the endemic bird in the photo is actually the Mockingbird. 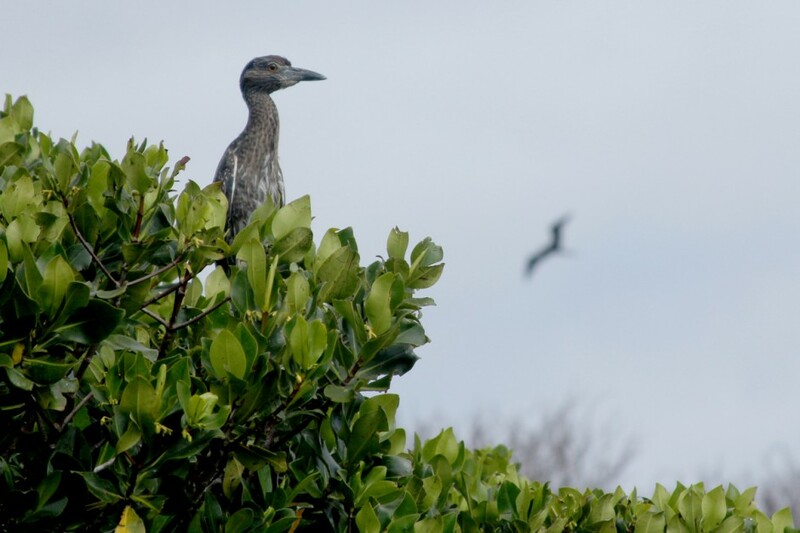 Here, a juvenile Yellow Crowned Night Heron looks out from a nest in a thicket of red mangrove. A Frigate Bird flies in the background. 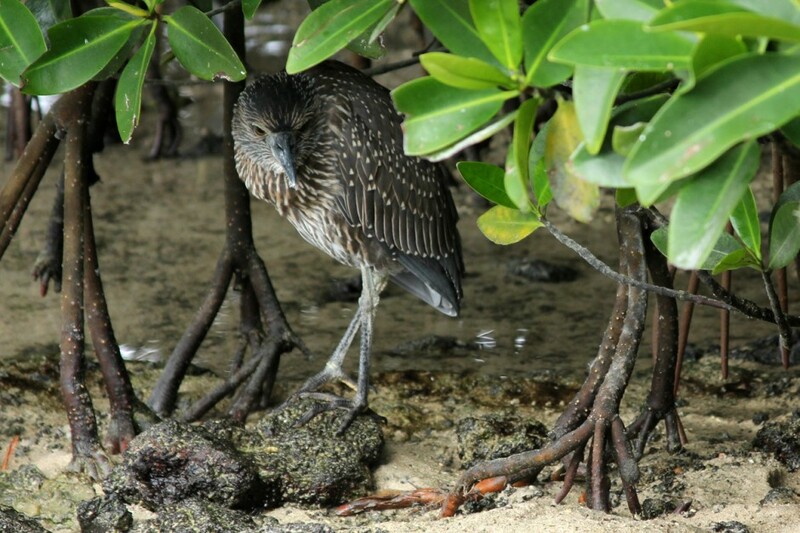 A Yellow Crowned Night Heron's talons mimic the shapes of the red mangrove roots. Mangroves are instrumental in retaining and even generating soil -- they thrive in salt water and protect the land from erosion. 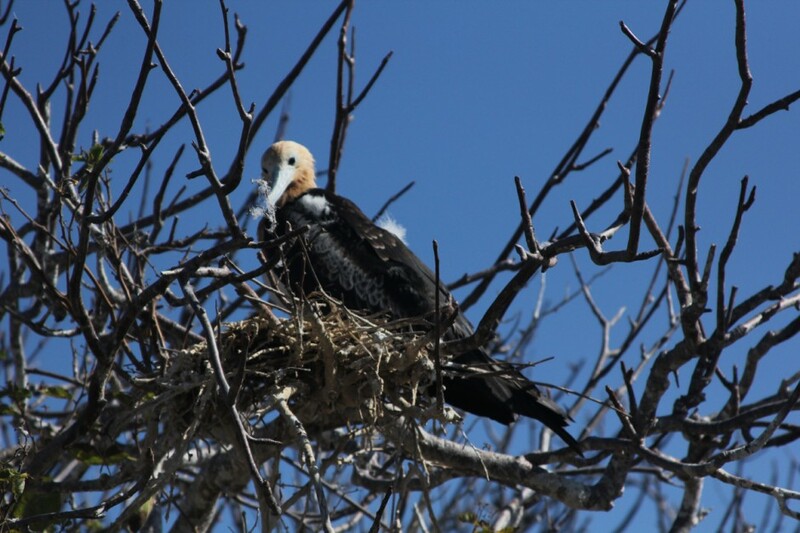 Here, a male Great Frigatebird minds the nest and the chick. Frigatebirds are seasonally monogamous, and both parents care for the chick for its first three months of life (after that, it's the mother bird's duty for the next eight months). Here, you can see the male's deflated and fading gular pouch. Prior to mating, this throat sack is red as the devil and he inflates it to attract his mate. After mating it fades in color. 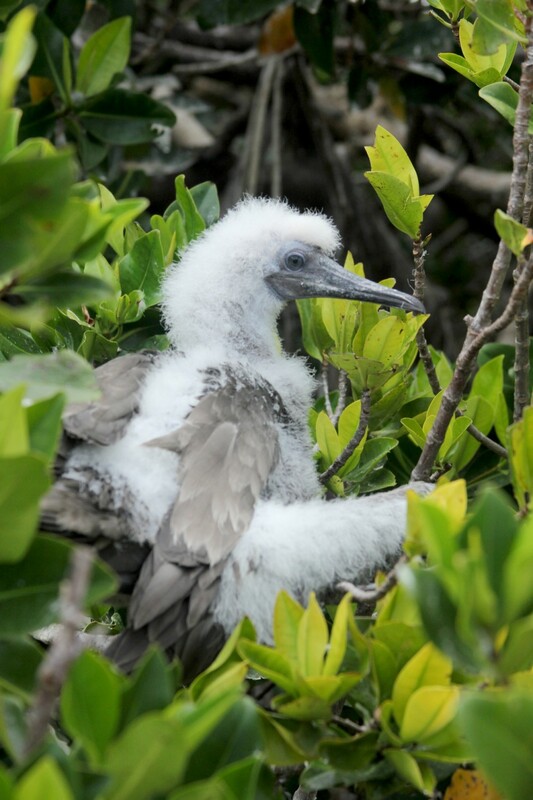 A juvenile Red-footed Boobie sits in the nest in red mangroves. Red-footed Boobies make their home in trees, while Nazca Boobies are ground nesters. This is one way for the amateur bird enthusiast to tell the dull-colored young of either species apart on this island where there are no Blue-footed Boobies. 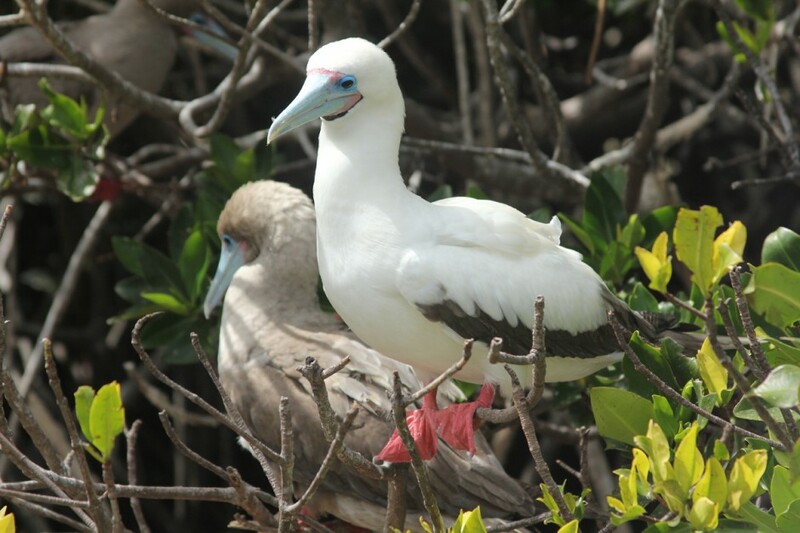 This is a mated pair of Red-footed Boobies. There are two kinds, white and brown -- the brown type is the most common. A juvenile Frigatebird sits in a palo santo tree. This bird is nearly as large as its parents, but still being fed by its mother. 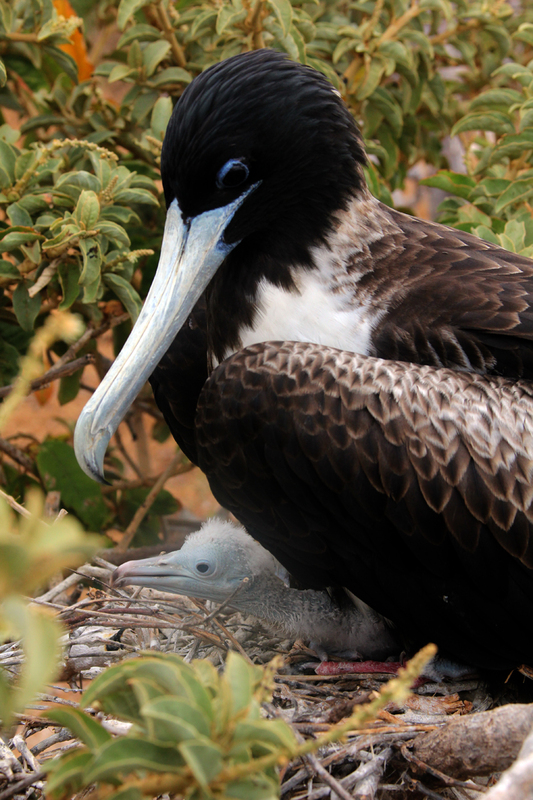 Frigatebirds are fed by their mothers longer than any other bird. Both Great and Magnificent Frigatebirds are native to the Galápagos, and the only way to tell the adults apart is by the hue of their black feathers in direct sunlight. The Magnificent Frigatebirds' feathers have a reddish hue, while the Great Frigatebirds' feathers have a green tint. 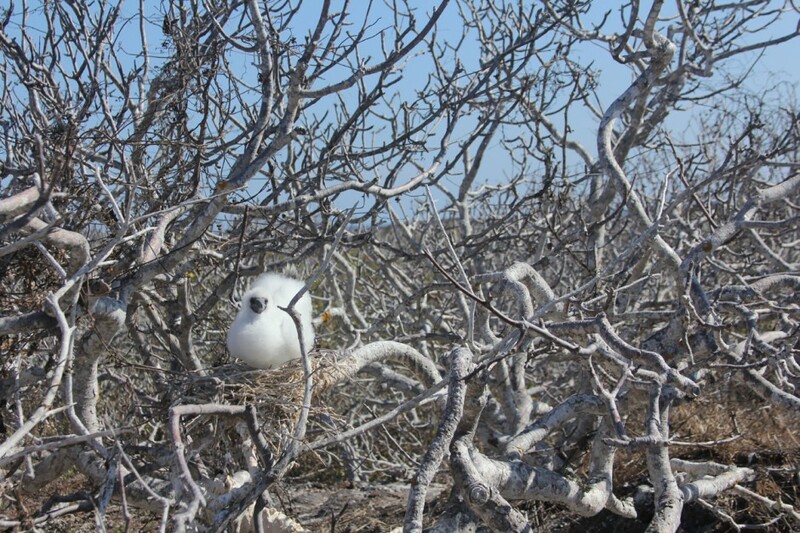 A Red-footed Boobie chick sits in a nest in a palo santo tree. 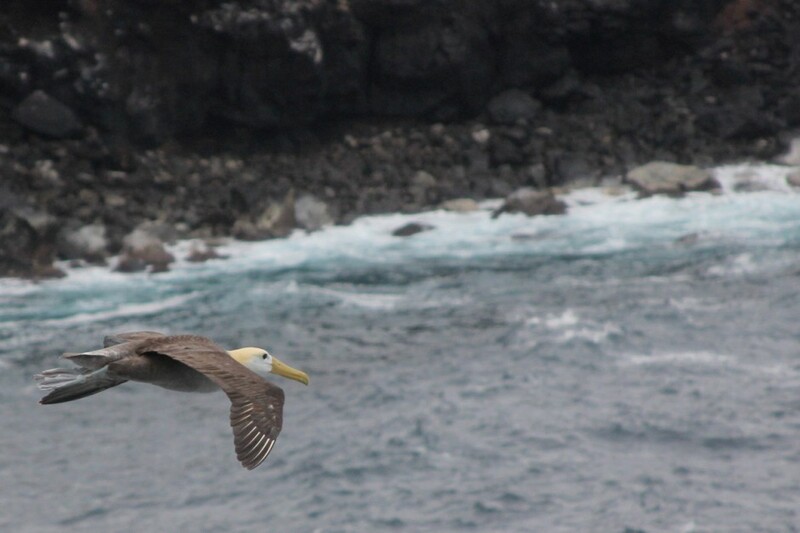 A Nazca Boobie flies over Prince Phillip's Steps on Isla Genovesa. 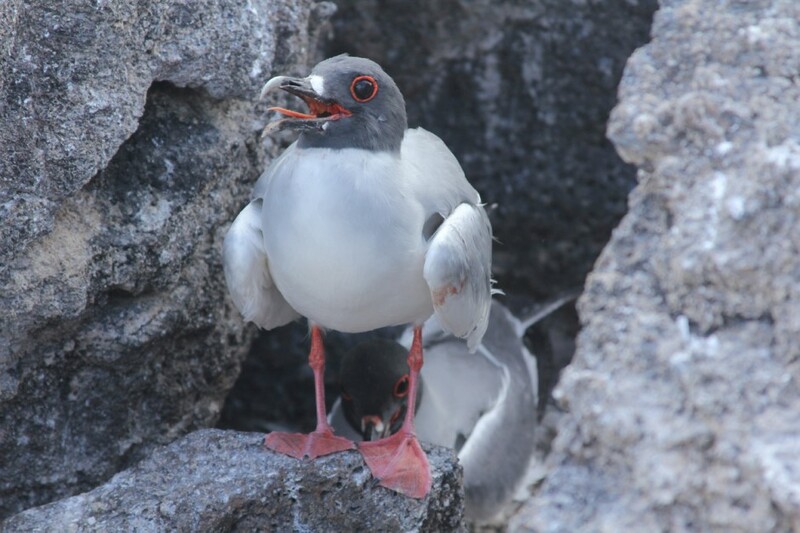 A Nazca Boobie chick is fed by its mother -- her beak stretches along the bottom to accommodate the large head of her chick. 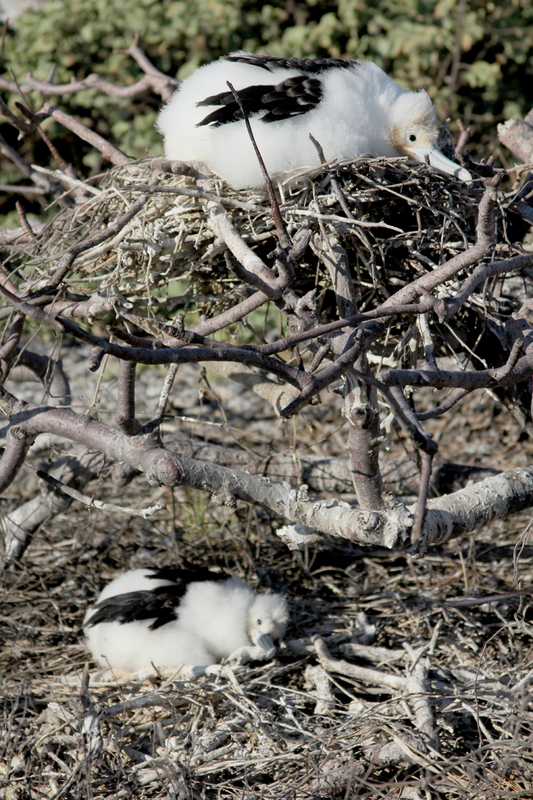 Two separate nests appear to be bunk-beds for Frigatebird chicks. 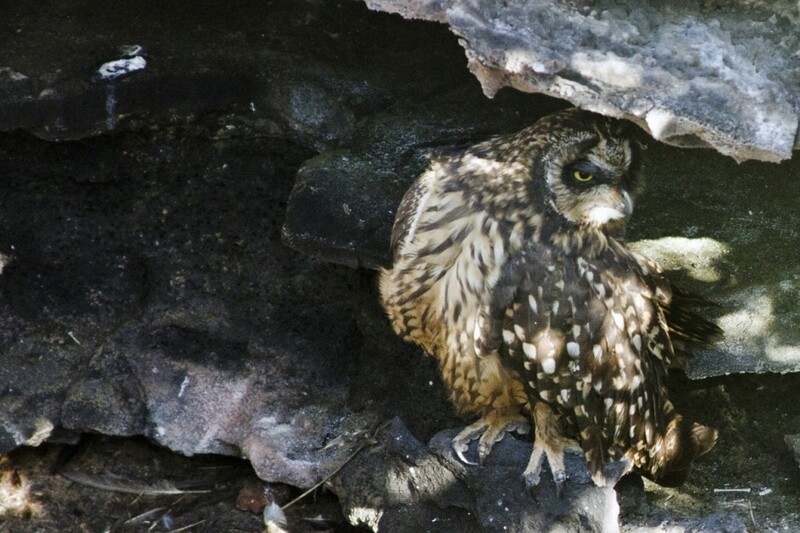 A Short-eared Owl sits in its nesting area in a crevice in Isla Genovesa. 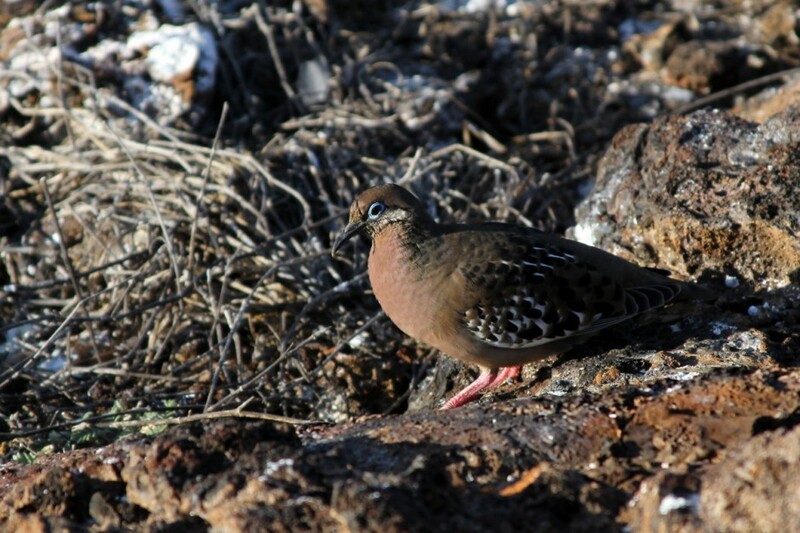 The Galápagos Dove is one of the 23 endemic bird species of the Galápagos Islands. 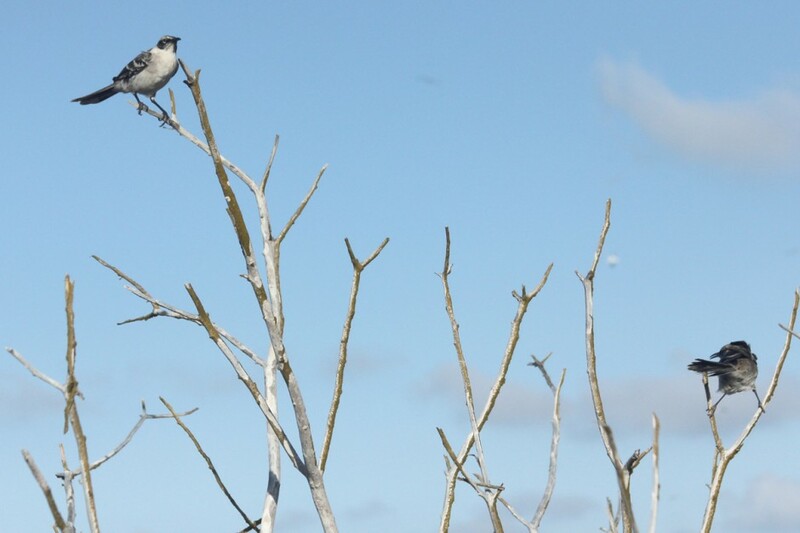 Two Galápagos Mockingbirds alight in a palo santo tree. There are four endemic species of Mockingbirds in the Galápagos. 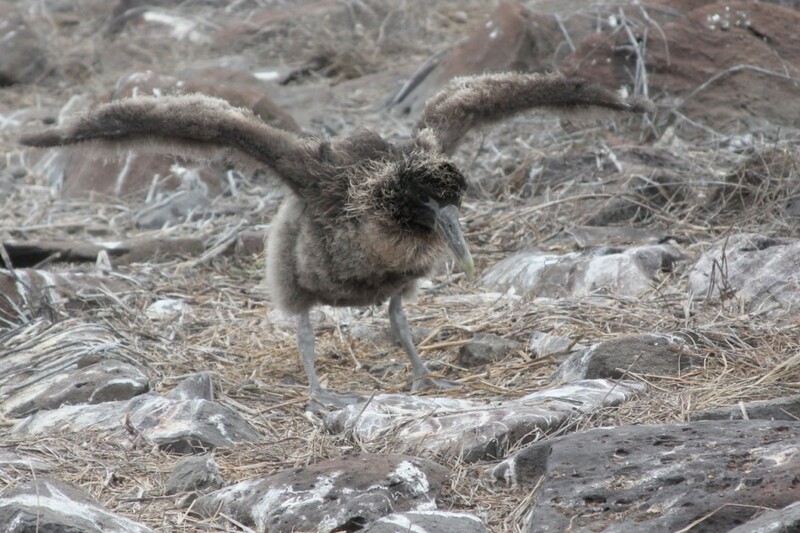 A juvenile Nazca Boobie tests its wings. 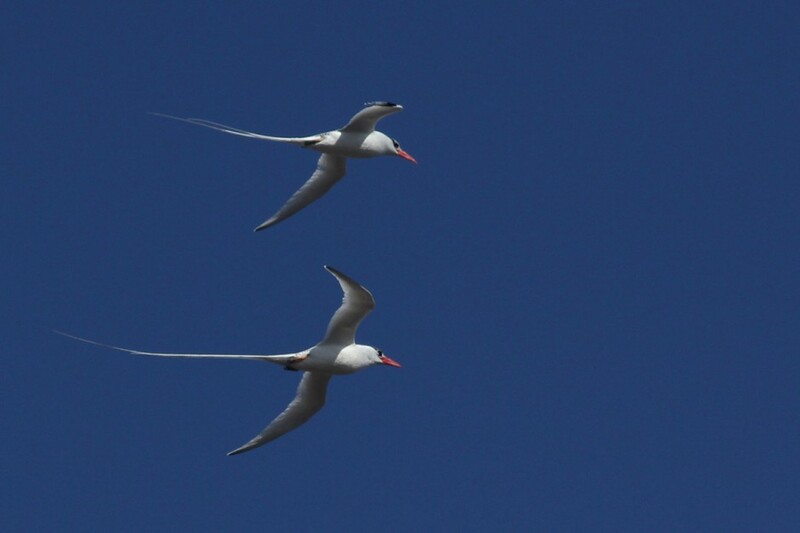 Red-billed Tropicbirds fly in tandem. These birds are not endemic to the Galápagos, and can be found in tropic areas of the Atlantic, eastern Pacific, and Indian Oceans. 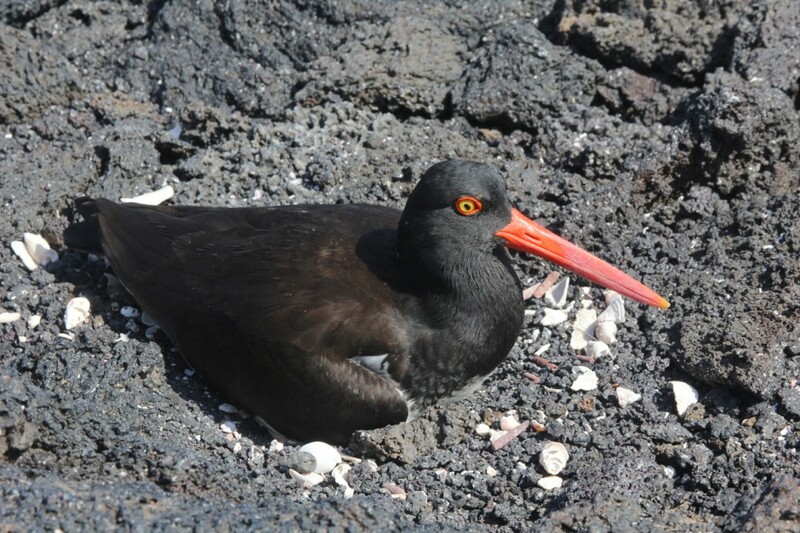 An American Oystercatcher takes a load off on the black lava of Isla Fernandina. 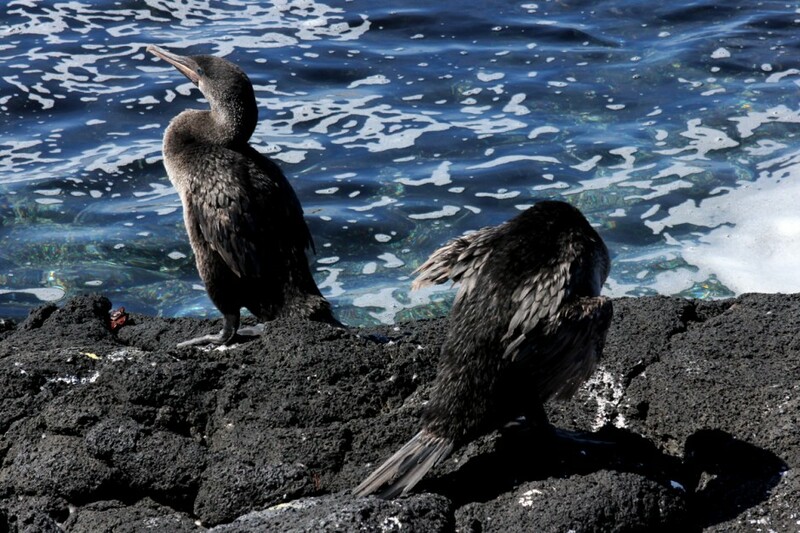 Flightless Cormorants are one of the endemic bird species of the Galápagos Islands. Here you can see the tiny wings of one bird. We saw one diving while snorkeling one day, and they zing past so quickly as they fish beneath the water. In this species, females compete for male attention, proving their worthiness through size and strength. 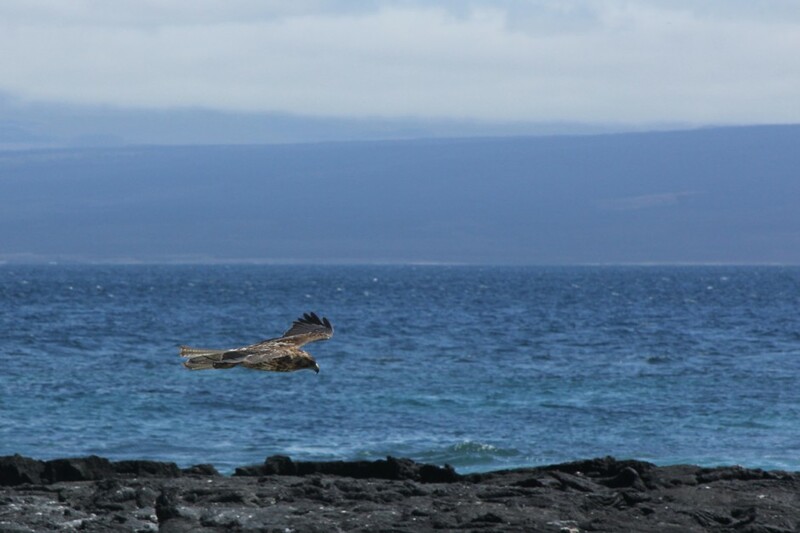 A juvenile Galápagos Hawk flies over Punta Espinoza. 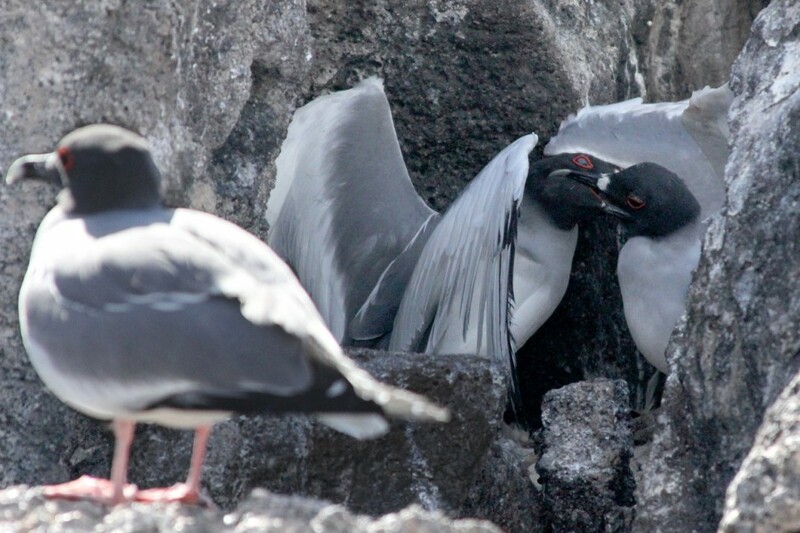 These birds get quite large and feed on bird hatchlings and lizards -- occasionally even on marine iguanas. 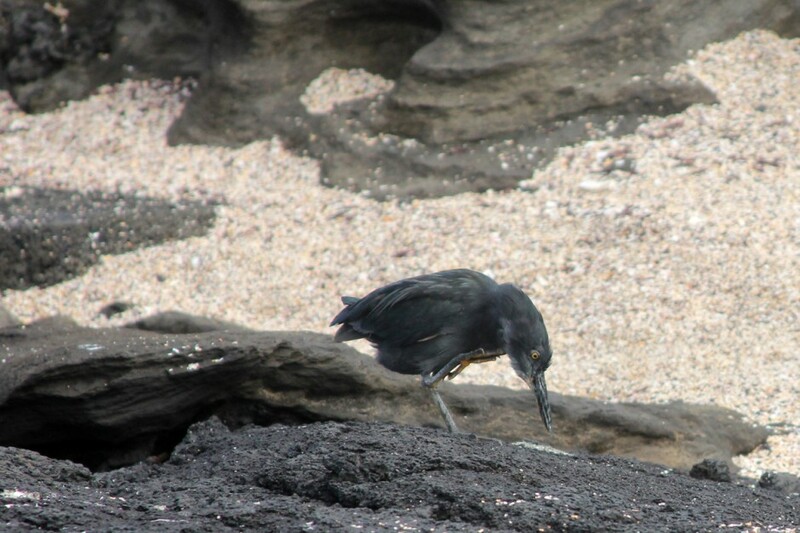 The Lava Heron is endemic to the Galápagos. Its grey color helps it blend in with the lava that is its namesake. This one is stalking something, probably a sally lightfoot crab. 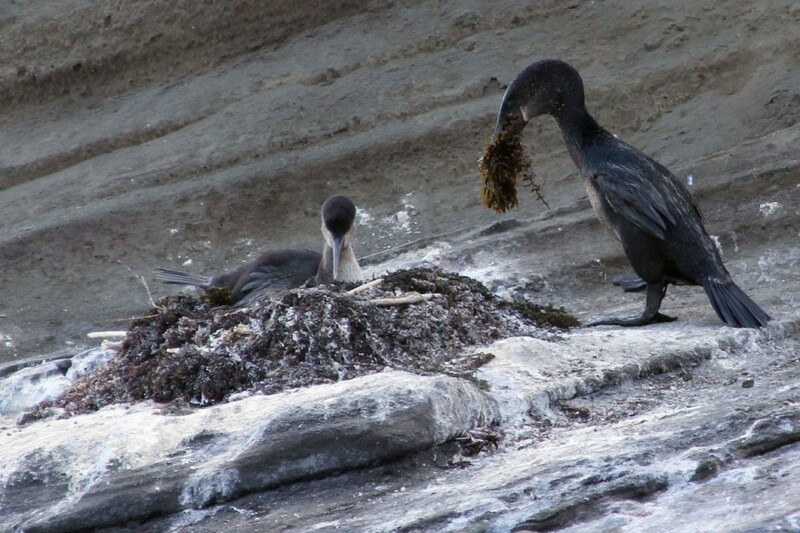 A male Flightless Cormorant brings some seaweed to his mate to line the nest. 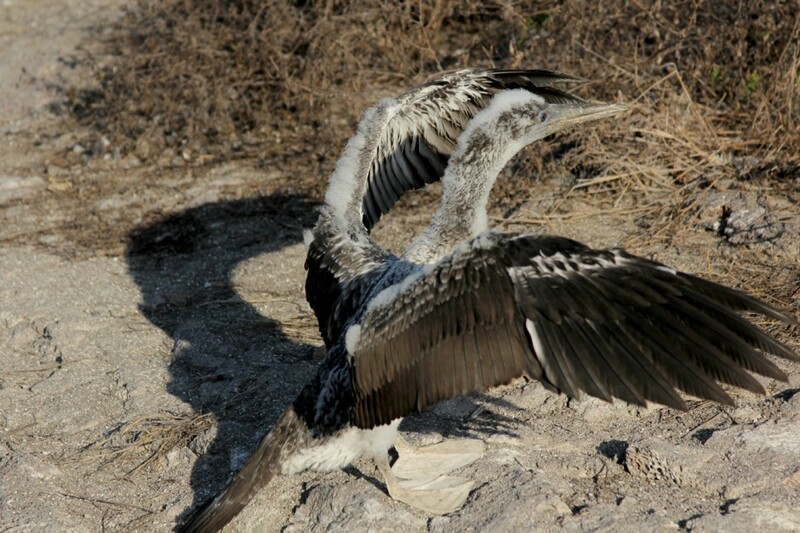 A juvenile Pelican struggles with a large fish caught in its throat. We were passing in a dinghy as he hopped and flapped his wings, trying to get it down. 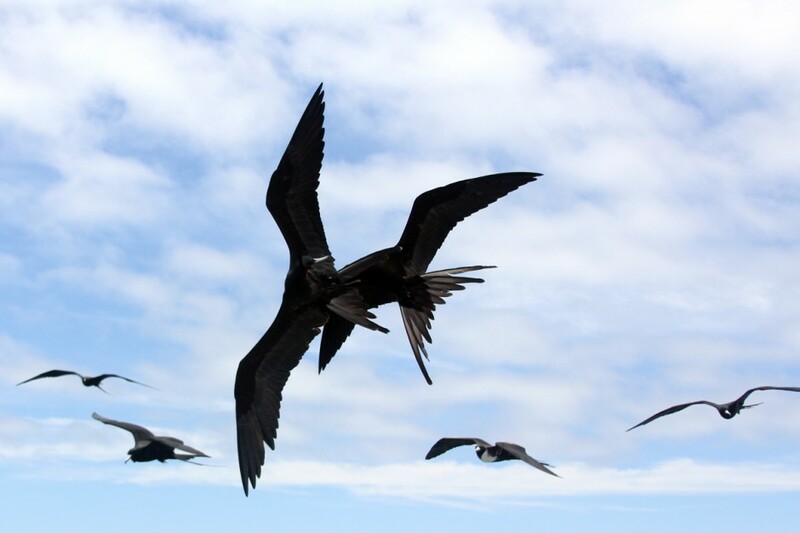 Frigatebirds are notorious for stealing the catch of other birds, forcing them to regurgitate in mid-air. 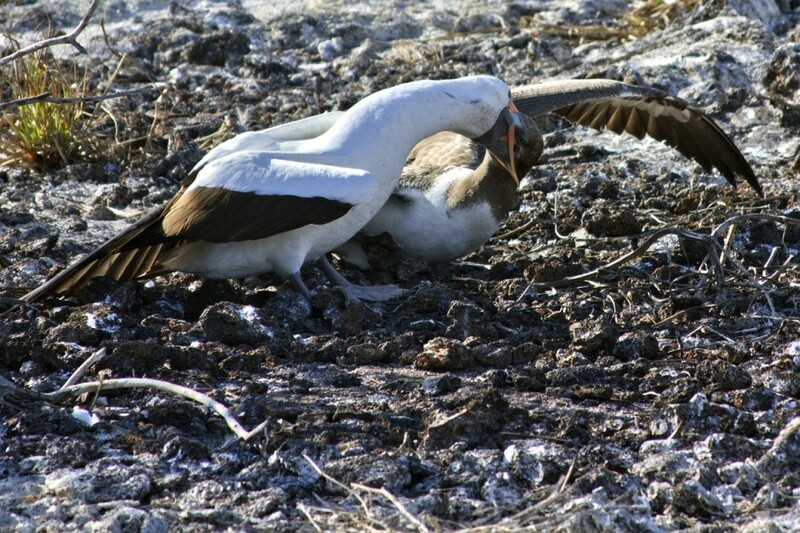 Here, one Frigatebird practices its attack on another. These birds followed the Eric all day. Frigatebirds can remain in the air for days at a time. 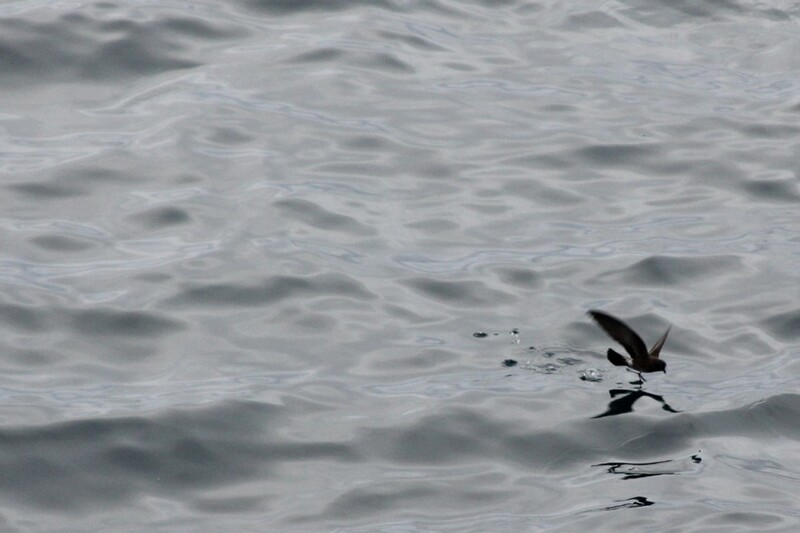 A Storm-petrel off Isla Santiago skims the water's surface. Petrels are named for St. Peter because they appear to be able to walk on water. This is likely a White-vented Storm-petrel, the most commonly seen kind in the area. 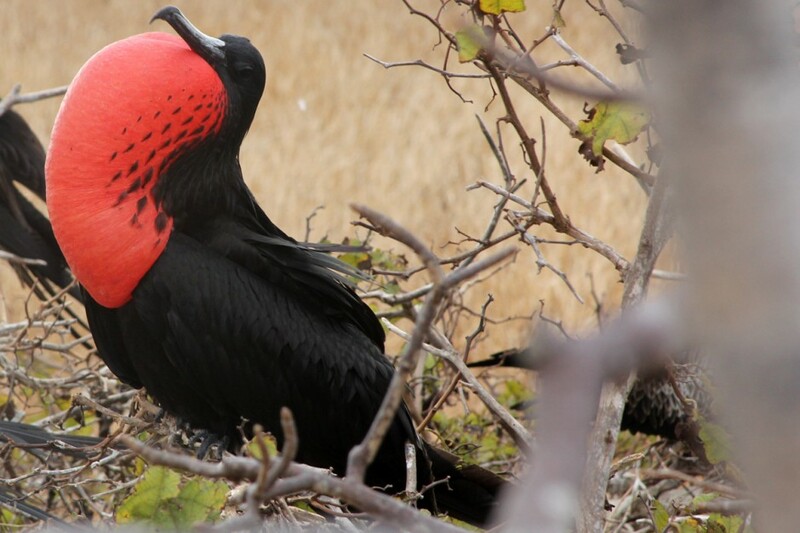 A male Great Frigatebird on North Seymour is ready to mate. His unweildy gular pouch is inflated. Believe it or not, these guys can fly with the pouches inflated. The strange weightless quality of the red pouches is evident as the birds go about their business. As they preen, the red sacks joggle and bounce like balloons. 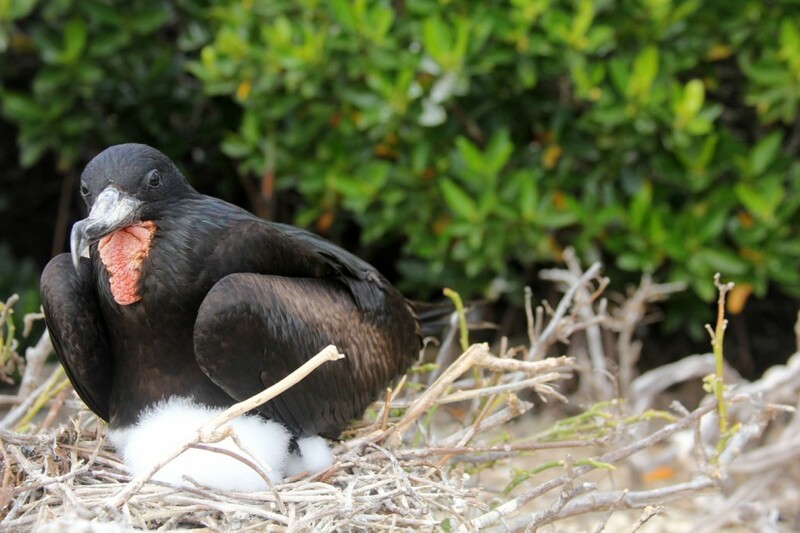 A new Frigatebird chick pokes its head out from under its mother's breast. 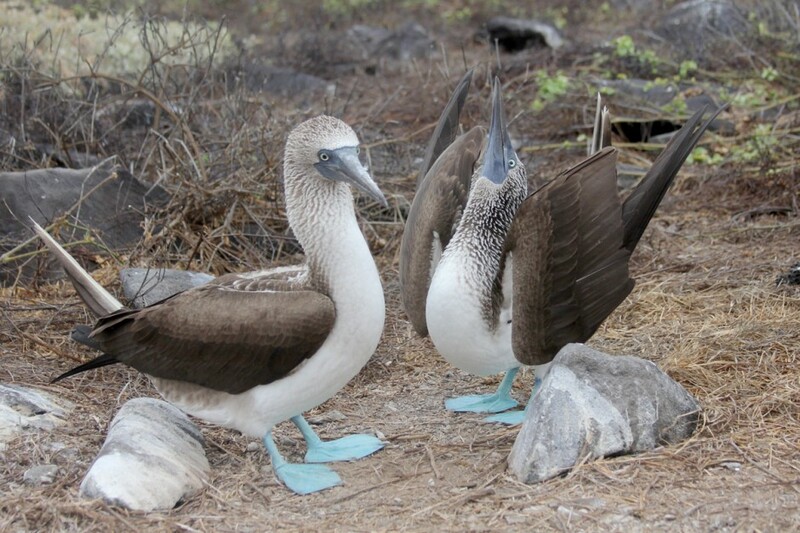 Blue-footed Boobies have a particular mating dance. Here, one is sky-pointing. They walk in their strange bobbing gait around one another in circles and pose for each other. A juvenile Waved Albatross tests its wings. The size of this chick was impressive and our guide, Ceci Guerrero, said that the chicks are safe from predators due to their size. 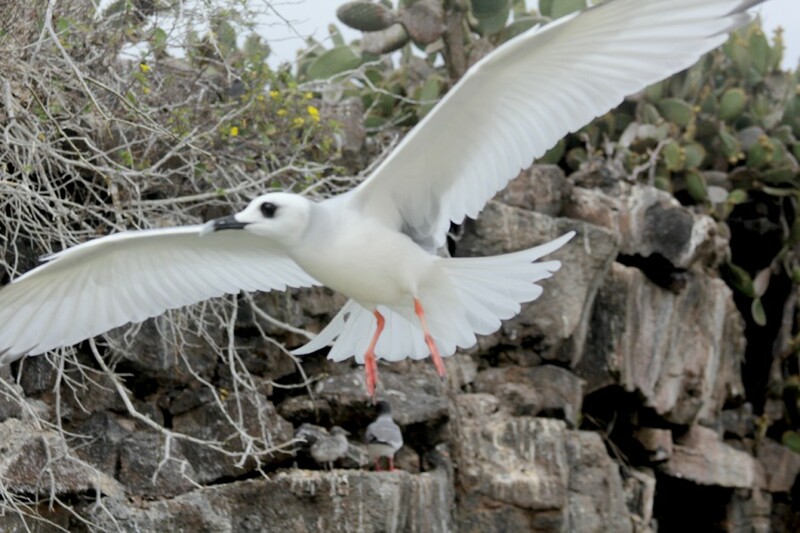 Isla Española is the world's main breeding ground for these birds. A Waved Alabatross takes off from a cliff on Punta Suarez. These birds need a high vantage point to get going, but are famous for their flying efficiency once they do. Their name is derived from the black and white wave pattern of the feathers on their bodies. 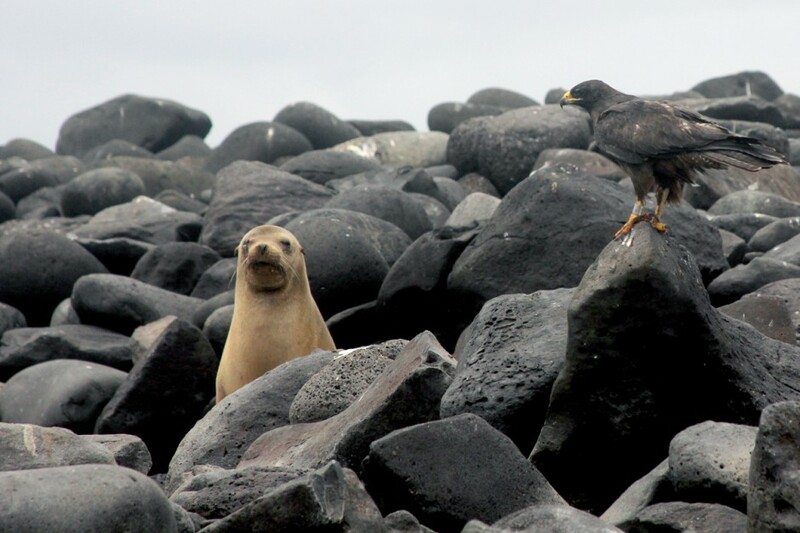 A Galápagos Hawk lights on a rock near a sea lion colony.